The Philippines has significant livestock industries, which account for about 16% of total agricultural production. Most of the livestock (cattle, carabao (buffalo), goats, and pigs) is held by smallholders. Due to rapid population growth and escalating commodity prices, increasing food self-sufficiency is a major concern for the Philippines’ government. Although animal identification has long been used to show ownership, techniques are being used to track the movement of animals to help manage outbreaks of contagious diseases. This enables rapid preventive measures and may shorten the life of a disease outbreak—thereby creating both commercial and animal welfare benefits. 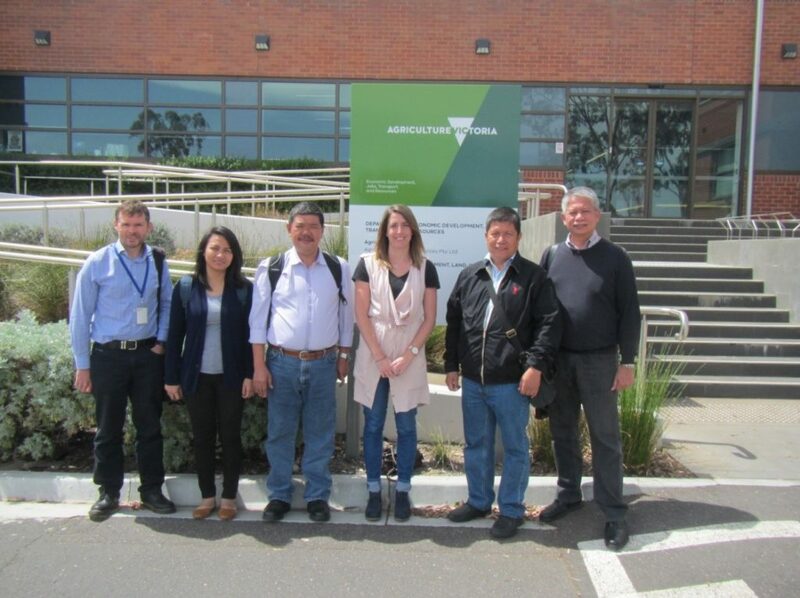 Following on from a scoping study on livestock identification in the Philippines in 2013-14, a delegation from the Philippines, hosted by Agriculture Victoria staff Ms Marnie Dortmans and Dr Cameron Bell, recently concluded an eight-day study tour. The training visit looked at livestock identification and traceability in Victoria, particularly for cattle, to assist with the design and implementation of a national livestock identification and traceability system for the Philippines. The delegation consisted of officials from the Philippines Bureau of Animal Industry (Department of Agriculture) and from the Federation of Cattle Raisers Associations of the Philippines. L to R: Dr Cameron Bell (Agriculture Victoria), Ms Anna Eusebio (Bureau of Animal Industry), Dr Paul Limson (Bureau of Animal Industry), Ms Marnie Dortmans (Agriculture Victoria), Mr Edwin Sanchez (Federation of Cattle Raisers Associations of the Philippines) and Mr Virgilio Badilla (Federation of Cattle Raisers Associations of the Philippines). A range of sites in Victoria were visited by the group to see the National Livestock Identification System (NLIS) in use, including saleyards, farms, an abattoir and tag manufacturers. A number of Agriculture Victoria staff also spoke to the delegation about information management systems, tag sales, on-farm use and regulatory activities. In the final report on their training, Dr Bell stated that the delegation learnt a lot in their short visit—it provided much insight into the practical operation of the NLIS and its application for market access, animal biosecurity, food safety, ownership and on-farm management. “Supporting activities such as the implementation of livestock identification and traceability in our region is important. Having a high animal health status in countries in our region reduces disease risks for Australia. For example, the Philippines was recently declared free of foot and mouth disease following an eradication program, and having a national livestock identification system will assist with maintaining this status,” reported Dr Bell. We were pleased to read in their report that both the organisers and participants of the study tour are grateful for the support provided by the Fund for this training activity.